If there is such thing as beauty and brain then it would be that perfect description only that this time the phrase would be beauty and efficient. This is where you see good looks and good performance at play. I guess most women would opt for this machine because pink is usually and naturally their color but notwithstanding some men prefer pink too. So, let’s see how this unit was built and maybe you might want to own one. Before We go further into what this equipment is made up of, I will still like to highlight two special properties that it has and that is color and performance, either of them could really entice you to buy one for yourself but don’t do that just yet and let’s see the functions and features it has, shall we? Sunny Health and Fitness has a bunch of sports equipment and they have become a household name by virtue of their reputation and how long they have been in the business (Fitness Industry). So, ordinarily one will presume that any product with their name on it would surely be durable and serve the purpose it was designed for, and so does Sunny Health and Fitness Pink Magnetic Recumbent Bike. This unit is an additional product to their wide range of varieties. It comes with different levels of magnetic resistance (8 levels) to make you feel challenged and achieve your fitness goal. It is accompanied with LCD display console that is very easy to read. You can view the speed, distance, pulse, time, calories, scan function, and odometer on the display console and the data is reliable. 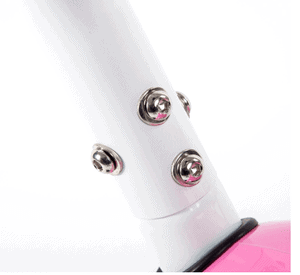 Easily adjust the tension through the manual resistance knob on the front vertical bar of the machine. The seat is positioned such that you will be seated in the semi-reclined position I guess that is why it is called the recumbent bike. Most people prefer Recumbent bike over the upright, you know why because it is less stressful to use even while you achieve a maximum fitness goal. Especially good for those who are recovering from illness or surgery and therefore need physical activity or exercise to nurse them back to health. Read the recumbent exercise bike benefits here. You can adjust the seat backward and forward by removing the knob connecting the back and front stabilizer and putting it into the suitable hole you desire and re-tight, and that’s it. It is also important to note how cushioned the seat is for a comfortable workout. Did you know that it also has heart rate sensors on the handlebar? Well, it has this function which allows you to read your heart rate on the display console. The flywheel has a suitable weight that allows you to ride smoothly and stable in both directions. While the pedal straps ensure that your feet don’t slip away from the pedal; that is what I call safety measure. It has a generally good weight of 49 pounds and supports about 220 pounds. Tell you what, this unit has positive reviews from the actual users; you can view these reviews on the product page on Amazon. It has a perimeter flywheel that allows the weight of the flywheel to distribute to everywhere instead of on the center, and that is why it works both directions, which means you can pedal forward or backward and still gives you a smooth ride. There is no noise pollution while using this piece which means you will not only workout without disturbing the peace of others….and yourself but you can as well listen to your favorite music or watch your favorite TV show, whichever one that goes down with you very well. 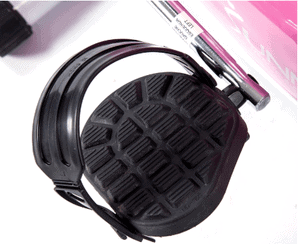 Tension Resistance– It has about 8 magnetic resistance levels to choose from while using this unit. In other words, you can challenge yourself as much as you want in order to achieve a result. The more you challenge yourself by increasing the resistance the more likely you will burn more calories. LCD Display– It has an LCD display console that allows you to read and monitor your progress by seeing the stats such as speed, pulse, time, distance, calories, odometer, and scan. The LCD display is easy to use; it has about 3 buttons which include, Mode, Enter, and Set. You can simply select any function by pressing the Mode button, while Enter allows you to select the value and the Set button allows you to reset the value. The LCD display automatically starts to show data without having to do any setting. Once you start pedaling the display will begin to show data. Heart Rate Monitor- This, as you may know, allows you to know your heart rate while working out. It is great in revealing the state of your pulse when exercising. 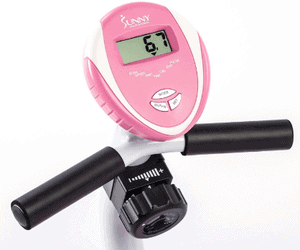 The heart rate sensor is located on the handlebar beside your hips. You must know that your heart rate is read-only when you hold the handlebars during a workout. Electricity– This unit does not require any electricity or power in order to function. All that is required is AA batteries to power the LCD display. So, placing it beside an electric socket is out of the equation because you don’t really need that. Seat vs Comfort– Most often I have seen where people complain about seats on a recumbent or upright bike. If the seat is not well positioned and padded then chances are users will not be comfortable while exercising with the equipment. And you need all the comfort you can get while working out in order to reach your potential and achieve a maximum result. In the case of Sunny Health and Fitness Pink Magnetic Recumbent Bike, it is a settled matter because the seat and the back support is great padded with foam and vinyl cover. The seat is about 15 inches wide and 11 inches depth which is big enough size to make just about anyone comfortable. 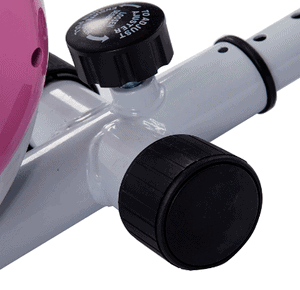 Accessories– Unfortunately, there are no accessories such as water bottle holder, fans, or speakers. Assembly– This equipment is pretty easy to assemble, even a 3-year-old can put it together…OK, maybe not quite but it is very easy to set up. You can put it together for an hour or two, however, it will be a lot easier to set up if you have someone to help you. Dimensions– The product dimensions are 53’’ L x 24’’ W x 34’’ H, whereas the product weighs 49 pounds. Shipping Dimensions– The product box dimensions are 23.3 L x 12.2 W x 25.6 H, the measurement unit is in inches, please. The shipping weight is 56 pounds. It has no accessories like a speaker, iPod or iPad plugin. This is pretty much fine equipment that would deliver at a considerable price. For the fact it has no accessories does not really mean it must have because what you pay is what you get and even more. To be honest, you are getting much more value for the price, therefore, should not complain. So, if you are considering buying this unit because it is within your budget, then, by all means, go for it but if you think you need more functions then look up the Schwinn 270 Recumbent Bike Review. Do not hesitate to drop your comment in the box below. Hi! Thanks for this overview. It is a great equipment for a normal price. We don’t need really more functions and lot of us are surely satisfied with this one. Maybe a present or your sister or mom? Nice review and looks like a very compact unit that would fit anywhere in any size accommodation. I don’t personally use this type of equipment but I do like your review of the product. I have to say that I am very impressed by the amount of knowledge within this review, I’ve been looking at exercise bikes for my family and myself but the biggest problem is that we range in height not to mention the age difference, my Husband is 6’6″ my youngest is 6’3″ and I’m 5’2″ and therefore the Sunny Health and Fitness Pink Magnet Recumbent Bike sounds great and exactly what we need although my Son might complain about the colour, Pink is not really his shade 😉 Perfect for me though! Your link is extremely useful and very helpful, all I need with just one click, very smooth and has most certainly made it easy for me to make a future purchase 🙂 just need the rest of the family to agree! I will be taking a look at Sunny Health and Fitness for other products also, great to have recommendations makes for an easy life. Thank you so much, June,but just so you know, if you are making the purchase make sure you buy from an Amazon seller that has good customer service rating in order to avoid any issues you may have arising from a malfunctioning unit. Great review of a good entry level exercise bike. If I’m honest the pink color puts me off a little. I will take a look at Sunny Health and Fitness for other products. Have you reviewed any? Well I am suprised that the color puts you off, however, anything is possible after all. Yes, I would suggest you look at the Exerpeutic 400XL Folding Recumbent Exercise Bike, although it is not Sunny Health and Fitness product.